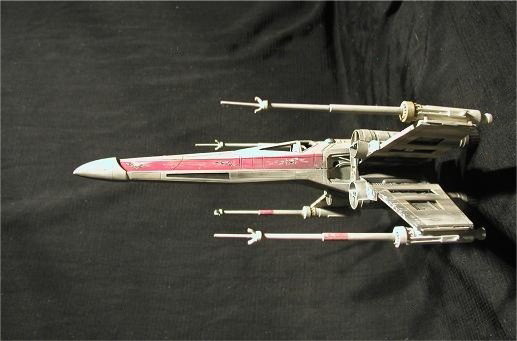 This production miniature is an X-wing and it was screen used in Return of the Jedi. This model was based on a standard model at the time, which was common in both The Empire Strikes back and Return of the Jedi, although it has a complete metal substructure. 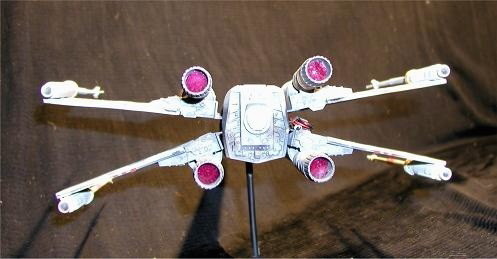 This particular model was used in the hyperspace jump scenes prior to the attack on the Death Star II; the rear photo shows the glow from the material covering the engine thrust point. This model also has internal wiring for powering the engine lights, which was designed to run down the support pole of the model. Note, the black drape is covering an ILM crate.